Burnley are to round off their pre-season schedule with a Turf Moor friendly against La Liga side Espanyol. Sean Dyche’s side will host the Barcelona-based club on Sunday, August 5th (kick-off 1-30 p.m). The game comes after the second leg of the Clarets’ Europa League second qualifying round tie, a week before the start of the new Premier League season. Espanyol are four-time Copa del Rey winners and twice-UEFA Cup finalists who finished 11th in La Liga last season, and will come to Burnley with a new man in charge following the appointment of Joan Francesc Ferrer as head coach. Barcelona-born ‘Rubi’ returns to the club where he coached the B team a decade ago, having led Huesca to promotion to Spain’s top division for the first time in their history last season. The 48-year-old, who also previously managed Girona, Valladolid and Levante and worked on the coaching staff at Barcelona, replaces former Watford boss Enrique Sanchez Flores, who left the ‘Budgerigars’ in April. 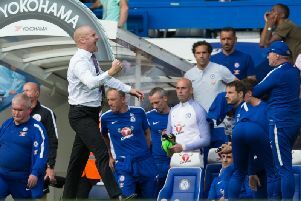 The game against Espanyol will be Burnley’s second pre-season friendly against top-flight European opposition following a visit from French Ligue 1 club Montpellier a week earlier. The Clarets could then be involved in a third qualifying round tie of the Europa League four days later, with the Premier League season scheduled to start on the weekend commencing Saturday, August 11th. Premier League fixtures will be released next Thursday, June 14th, with the Europa League draw for first and second qualifying round draws involving Burnley taking place in Nyon, Switzerland on Wednesday, June 20th. Friday, 13 July; Cork City (away), kick-off 7pm. Friday, 20 July; Macclesfield Town (away) and Curzon Ashton (away), both kick-off 7.45pm. Monday, 23 July; Preston North End (away), kick-off 7.45pm. Thursday, 26 July; Europa League 2nd qualifying round, first leg. Sunday, 29 July; Montpellier (home), kick-off 1.30pm. Thursday, 2 August; Europa League 2nd qualifying round, second leg. Sunday, 5 August; Espanyol (home) kick-off 1.30pm. Thursday, 9 August; Europa League 3rd qualifying round, first leg (subject to winning in 2nd round). Saturday, 11 August: Start of Premier League season. Thursday, 16 August; Europa League 3rd qualifying round, second leg (subject to winning in 2nd round).